Cook potatoes in a large pot of boiling, salted water for ­­­10-15 minutes until tender. Drain them. In a small pan over medium-high heat, sauté garlic, onion, thyme, and chives in butter for 2 minutes. 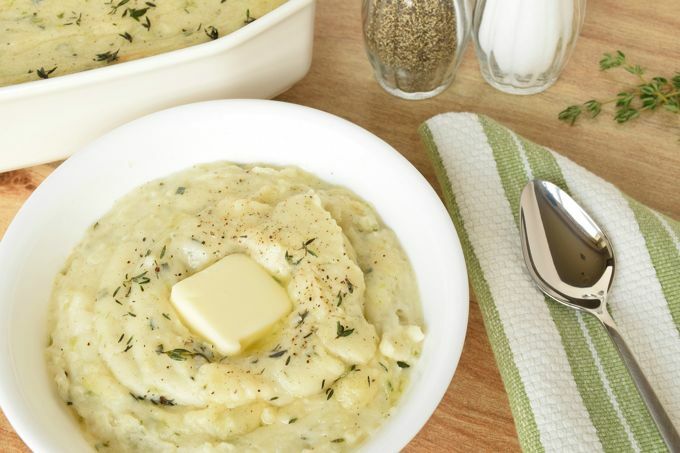 With a mixer, mash the potatoes, onion/butter mixture, cream cheese, whipping cream, salt, and 1½ tsp. pepper on low to then medium speed. Mix until everything is nicely blended together. It will be thick. Don’t add additional whipping cream. (It will thin when it’s baked in the oven with the Brie.) Taste it to adjust the seasoning if needed. By hand, stir in the Brie cheese. Transfer it to a 1½ quart casserole dish. Refrigerate until ready to bake. Preheat oven to 450°. Bake for 15 minutes. Garnish it with thyme or chives and freshly ground pepper.